Cysteine proteases, also known as thiol proteases, are enzymes that degrade proteins. These proteases share a common catalytic mechanism that involves a nucleophilic cysteine thiol in a catalytic triad or dyad. Cysteine proteases are commonly encountered in fruits including the papaya, pineapple, fig and kiwifruit. The proportion of protease tends to be higher when the fruit is unripe. In fact, dozens of latices of different plant families are known to contain cysteine proteases. Cysteine proteases are used as an ingredient in meat tenderizers. The MEROPS protease classification system counts 14 superfamilies plus several currently unassigned families (as of 2013) each containing many families. Each superfamily uses the catalytic triad or dyad in a different protein fold and so represent convergent evolution of the catalytic mechanism. For superfamilies, P = superfamily containing a mixture of nucleophile class families, C = purely cysteine proteases. superfamily. Within each superfamily, families are designated by their catalytic nucleophile (C = cysteine proteases). Reaction mechanism of the cysteine protease mediated cleavage of a peptide bond. The first step in the reaction mechanism by which cysteine proteases catalyze the hydrolysis of peptide bonds is deprotonation of a thiol in the enzyme's active site by an adjacent amino acid with a basic side chain, usually a histidine residue. The next step is nucleophilic attack by the deprotonated cysteine's anionic sulfur on the substrate carbonyl carbon. In this step, a fragment of the substrate is released with an amine terminus, the histidine residue in the protease is restored to its deprotonated form, and a thioester intermediate linking the new carboxy-terminus of the substrate to the cysteine thiol is formed. Therefore, they are also sometimes referred to as thiol proteases. The thioester bond is subsequently hydrolyzed to generate a carboxylic acid moiety on the remaining substrate fragment, while regenerating the free enzyme. Cysteine proteases play multi-faceted roles, virtually in every aspect of physiology and development. In plants they are important in growth and development and in accumulation and mobilization of storage proteins such as in seeds. In addition, they are involved in signalling pathways and in the response to biotic and abiotic stresses. In humans and other animals, they are responsible for senescence and apoptosis (programmed cell death), MHC class II immune responses, prohormone processing, and extracellular matrix remodeling important to bone development. The ability of macrophages and other cells to mobilize elastolytic cysteine proteases to their surfaces under specialized conditions may also lead to accelerated collagen and elastin degradation at sites of inflammation in diseases such as atherosclerosis and emphysema. Several viruses (e.g. polio, hepatitis C) express their entire genome as a singe massive polyprotein and use a protease to cleave it into functional units (e.g. Tobacco Etch Virus protease). Proteases are usually synthesized as large precursor proteins called zymogens, such as the serine protease precursors trypsinogen and chymotrypsinogen, and the aspartic protease precursor pepsinogen. The protease is activated by removal of an inhibitory segment or protein. Activation occurs once the protease is delivered to a specific intracellular compartment (e.g. lysosome) or extracellular environment (e.g. stomach). This system prevents the cell that produces the protease from being damaged by it. Protease inhibitors are usually proteins with domains that enter or block a protease active site to prevent substrate access. In competitive inhibition, the inhibitor binds to the active site, thus preventing enzyme-substrate interaction. In non-competitive inhibition, the inhibitor binds to an allosteric site, which alters the active site and makes it inaccessible to the substrate. Currently there is no widespread use of cysteine proteases as approved and effective anthelmintics but research into the subject is a promising field of study. Plant cysteine proteases isolated from these plants have been found to have high proteolytic activities that are known to digest nematode cuticles, with very low toxicity. 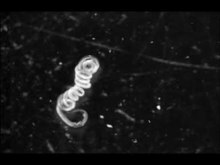 Successful results have been reported against nematodes such as Heligmosomoides bakeri, Trichinella spiralis, Nippostrongylus brasiliensis, Trichuris muris, and Ancylostoma ceylanicum; the tapeworm Rodentolepis microstoma, and the porcine acanthocephalan parasite Macracanthorynchus hirundinaceus. A useful property of cysteine proteases is the resistance to acid digestion, allowing possible oral administration. They provide an alternative mechanism of action to current anthelmintics and the development of resistance is thought to be unlikely because it would require a complete change of structure of the helminth cuticle. In several traditional medicines, the fruits or latex of the papaya, pineapple and fig are widely used for treatment of intestinal worm infections both in humans and livestock. Cysteine proteases are used as feed additives for livestock to improve the digestibility of proteins and nucleic acids. ^ Domsalla A, Melzig MF (June 2008). "Occurrence and properties of proteases in plant latices". Planta Med. 74 (7): 699–711. doi:10.1055/s-2008-1074530. PMID 18496785. ^ Mitchel, R. E.; Chaiken, I. M.; Smith, E. L. (1970). "The complete amino acid sequence of papain. Additions and corrections". The Journal of Biological Chemistry. 245 (14): 3485–92. PMID 5470818. ^ Sierocka, I; Kozlowski, L. P.; Bujnicki, J. M.; Jarmolowski, A; Szweykowska-Kulinska, Z (2014). "Female-specific gene expression in dioecious liverwort Pellia endiviifolia is developmentally regulated and connected to archegonia production". BMC Plant Biology. 14: 168. doi:10.1186/1471-2229-14-168. PMC 4074843  . PMID 24939387. ^ Sorimachi, H; Ohmi, S; Emori, Y; Kawasaki, H; Saido, T. C.; Ohno, S; Minami, Y; Suzuki, K (1990). "A novel member of the calcium-dependent cysteine protease family". Biological Chemistry Hoppe-Seyler. 371 Suppl: 171–6. PMID 2400579. ^ Grudkowska M, Zagdańska B (2004). "Multifunctional role of plant cysteine proteinases" (PDF). Acta Biochim. Pol. 51 (3): 609–24. PMID 15448724. ^ Chapman HA, Riese RJ, Shi GP (1997). "Emerging roles for cysteine proteases in human biology". Annu. Rev. Physiol. 59: 63–88. doi:10.1146/annurev.physiol.59.1.63. PMID 9074757. ^ Stepek G, Behnke JM, Buttle DJ, Duce IR (July 2004). "Natural plant cysteine proteinases as anthelmintics?". Trends Parasitol. 20 (7): 322–7. doi:10.1016/j.pt.2004.05.003. PMID 15193563. ^ Behnke JM, Buttle DJ, Stepek G, Lowe A, Duce IR (2008). "Developing novel anthelmintics from plant cysteine proteinases". Parasit Vectors. 1 (1): 29. doi:10.1186/1756-3305-1-29. PMC 2559997  . PMID 18761736. ^ O'Keefe, Terrence (6 April 2012). "Protease enzymes improve amino acid digestibility". Wattagnet. Retrieved 6 January 2018. Papain belongs to a family of related proteins with a wide variety of activities, including endopeptidases, aminopeptidases, dipeptidyl peptidases and enzymes with both exo- and endo-peptidase activity. Members of the papain family are widespread, found in baculoviruses, eubacteria, yeast, and practically all protozoa, plants and mammals. The proteins are typically lysosomal or secreted, and proteolytic cleavage of the propeptide is required for enzyme activation, although bleomycin hydrolase is cytosolic in fungi and mammals. Papain-like cysteine proteinases are essentially synthesised as inactive proenzymes (zymogens) with N-terminal propeptide regions. The activation process of these enzymes includes the removal of propeptide regions, which serve a variety of functions in vivo and in vitro. The pro-region is required for the proper folding of the newly synthesised enzyme, the inactivation of the peptidase domain and stabilisation of the enzyme against denaturing at neutral to alkaline pH conditions. Amino acid residues within the pro-region mediate their membrane association, and play a role in the transport of the proenzyme to lysosomes. Among the most notable features of propeptides is their ability to inhibit the activity of their cognate enzymes and that certain propeptides exhibit high selectivity for inhibition of the peptidases from which they originate. The papain precursor protein contains 345 amino acid residues, and consists of a signal sequence (1-18), a propeptide (19-133) and the mature peptide (134-345). The amino acid numbers are based on the mature peptide. The protein is stabilised by three disulfide bridges. Its three-dimensional structure consists of two distinct structural domains with a cleft between them. This cleft contains the active site, which contains a catalytic diad that has been likened to the catalytic triad of chymotrypsin. The catalytic triad is made up of the amino acids - cysteine-25 (from which it gets its classification) and histidine-159. Aspartate-158 was thought to play a role analogous to the role of aspartate in the serine protease catalytic triad, but that has since been disproved. The mechanism by which papain breaks peptide bonds involves the use of a catalytic triad with a deprotonated cysteine. Asn-175 helps to orient the imidazole ring of His-159 to allow it to deprotonate the catalytic Cys-25. This cysteine then performs a nucleophilic attack on the carbonyl carbon of a peptide backbone. This forms a covalent acyl-enzyme intermediate and frees the amino terminus of the peptide. The enzyme is deacylated by a water molecule and releases the carboxy terminal portion of the peptide. In immunology, papain is known to cleave the Fc (crystallisable) portion of immunoglobulins (antibodies) from the Fab (antigen-binding) portion. Papain is a relatively heat-resistant enzyme, with an optimal temperature range of 60 and 70 °C. Papain prefers to cleave at: (hydrophobic)-(Arg or Lys)- cleaves here -(not Val). Hydrophobic is Ala, Val, Leu, Ile, Phe, Trp, or Tyr. Anthelmintic effect of papain on the worm Heligmosomoides bakeri. Papain breaks down tough meat fibres, and has been used for thousands of years to tenderise meat eaten in its native South America. Meat tenderisers in powder form with papain as an active component are widely sold. Papain can be used to dissociate cells in the first step of cell culture preparations. A ten-minute treatment of small tissue pieces (less than 1 mm cubed) will allow papain to begin cleaving the extracellular matrix molecules holding the cells together. After ten minutes, the tissue should be treated with a protease inhibitor solution to stop the protease action. Left untreated, papain activity will lead to complete lysis of the cells. The tissue must then be triturated (passed quickly up and down through a Pasteur pipette) to break up the pieces of tissue into a single cell suspension. It is also used as an ingredient in various enzymatic debriding preparations, notably Accuzyme. These are used in the care of some chronic wounds to clean up dead tissue. Papain is added to some toothpastes and mint sweets as a tooth whitener. Its whitening effect is, however, minimal because the papain is present in low concentrations and is quickly diluted by saliva. It would take several months of use to have a noticeable effect. Papain is the main ingredient of Papacarie, a gel used for chemomechanical dental caries removal. It does not require drilling and does not interfere in the bond strength of restorative materials to dentin. Papain has been known to interfere with urine drug tests for cannabinoids. It is found in some drug detox products. Recently, it has been demonstrated that papain can be used to assemble thin films of titania used in photovoltaic cells. The papain-digested antibody: two Fab fragments and an Fc fragment. An antibody digested by papain yields three fragments: two 50 kDa Fab fragments and one 50kDa Fc fragment. The papain-digested antibody is unable to promote agglutination, precipitation, opsonization, and lysis. Papain is usually produced as a crude, dried material by collecting the latex from the fruit of the papaya tree. The latex is collected after scoring the neck of the fruit, where it may either dry on the fruit or drip into a container. This latex is then further dried. It is now classified as a dried, crude material. A purification step is necessary to remove contaminating substances. This purification consists of the solubilization and extraction of the active papain enzyme system through a government-registered process. This purified papain may be supplied as powder or as liquid. On September 23, 2008, the US Food and Drug Administration (FDA) warned companies to stop marketing ophthalmic balanced salt solutions and topical drug products containing papain by November 4, 2008. The FDA said, "Papain-containing drug products in topical form historically have been marketed without approval...". According to the FDA's statement on the subject, "These unapproved products have put consumers' health in jeopardy, from reports of permanent vision loss with unapproved balanced salt solutions to a serious drop in blood pressure and increased heart rate from the topical papain products," said Janet Woodcock, M.D., director for the Center for Drug Evaluation and Research. Topical drug ointments containing papain are used to remove dead or contaminated tissue in acute and chronic lesions, such as diabetic ulcers, pressure ulcers, varicose ulcers, and traumatic infected wounds. Trade names for these products include Accuzyme, Allanfil, Allanzyme, Ethezyme, Gladase, Kovia, Panafil, Pap Urea, and Ziox. Other products are marketed under the names of the active ingredients, for instance, papain-urea ointment. In 2008 the FDA announced its intention to take action against these products because it had received reports of serious adverse events in patients using products containing papain. Reports included hypersensitivity (allergic) reactions that lead to hypotension (low blood pressure) and tachycardia (rapid heart rate). In addition, people allergic to latex can also be allergic to papaya, the source of papain, implying that people with latex sensitivity may be at increased risk of suffering an adverse reaction to a topical papain drug product. FDA recommended that people with concerns about using topical papain preparations contact their health care provider about discontinuing use. ^ a b Rawlings ND, Barrett AJ (1994). "Families of cysteine peptidases". Meth. Enzymol. 244: 461–486. doi:10.1016/0076-6879(94)44034-4. PMID 7845226. ^ Rawlings ND, Barrett AJ (1993). "Evolutionary families of peptidases". Biochem. J. 290: 205–218. doi:10.1042/bj2900205. PMC 1132403  . PMID 8439290. ^ Sebti SM, Lazo JS, DeLeon JC (1987). "Purification, characterization, and amino acid composition of rabbit pulmonary bleomycin hydrolase". Biochemistry. 26 (14): 4213–4219. doi:10.1021/bi00388a006. PMID 3117099. ^ Yamamoto Y, Takahashi SY, Kurata M, Watabe S, Murakami R (2002). "Novel cysteine proteinase inhibitors homologous to the proregions of cysteine proteinases". Curr Protein Pept Sci. 3 (2): 231–238. doi:10.2174/1389203024605331. PMID 12188906. ^ "UniProt P00784: Papain precursor - Carica papaya (Papaya)". UniProtKB. ^ Ménard R, Khouri HE, Plouffe C, Dupras R, Ripoll D, Vernet T, Tessier DC, Lalberté F, Thomas DY, Storer AC (July 1990). "A protein engineering study of the role of aspartate 158 in the catalytic mechanism of papain". Biochemistry. 29 (28): 6706–13. doi:10.1021/bi00480a021. PMID 2397208. ^ Chakravarthy P, Acharya S (October 2012). "Efficacy of extrinsic stain removal by novel dentifrice containing papain and bromelain extracts". J Young Pharm. 4 (4): 245–9. doi:10.4103/0975-1483.104368. PMC 3573376  . PMID 23493413. ^ Lopes MC, Mascarini RC, da Silva BM, Flório FM, Basting RT (2007). "Effect of a papain-based gel for chemomechanical caries removal on dentin shear bond strength". J Dent Child (Chic). 74 (2): 93–7. PMID 18477426. ^ Section of Toxicology, Department of Pharmacology; James H. Quillen College of Medicine, East Tennessee State University. "Papain: a novel urine adulterant". Johnson City, 37614, USA. ^ Bawazer LA, Ihli J, Levenstein MA, Jeuken LC, Meldrum FC, McMillan DG (2018). "Enzymatically-controlled biomimetic synthesis of titania/protein hybrid thin films". J Mater Chem B. 6 (23): 3979–3988. doi:10.1039/C8TB00381E. ^ Shuren J (2008-09-22). "Topical Drug Products Containing Papain; Enforcement Action Dates" (PDF). United States Food and Drug Administration, Department of Health and Human Services. The papain family has a wide variety of activities, including broad-range (papain) and narrow-range endo-peptidases, aminopeptidases, carboxypeptidases, dipeptidyl peptidases and enzymes with both exo- and endo-peptidase activity [PUBMED:7845226]. Members of the papain family are widespread, found in bacteria, archaea, fungi, and practically all protozoa, plants and mammals [PUBMED:7845226], and some viruses such as baculoviruses [PUBMED:1363350]. The proteins are typically lysosomal or secreted. The catalytic residues of papain are Cys-25 and His-159, other important residues being Gln-19, which helps form the 'oxyanion hole', and Asn-175, which orientates the imidazole ring of His-159. Most papain-like cysteine peptidases are irreversibly inhibited by the synthetic inhibitor E64 [PUBMED:7044372]. Leupeptin is a reversible inhibitor but is also an inhibitor of chymotrypsin-like serine peptidases. A papain-like cysteine proteinase is typically synthesised as an inactive precursor (or zymogen) with an N-terminal propeptide. Activation requires removal of the propeptide. The propeptide is required for the proper folding of the newly synthesised enzyme, maintaining the peptidase in an inactive state and stabilisation of the enzyme against denaturing at neutral to alkaline pH conditions. Amino acid residues within the pro-region mediate their membrane association, and play a role in the transport of the proenzyme to lysosomes. A propeptide can exhibit high selectivity for inhibition of the peptidase from which it originates [PUBMED:12188906]. A cysteine peptidase is a proteolytic enzyme that hydrolyses a peptide bond using the thiol group of a cysteine residue as a nucleophile. Hydrolysis involves usually a catalytic triad consisting of the thiol group of the cysteine, the imidazolium ring of a histidine, and a third residue, usually asparagine or aspartic acid, to orientate and activate the imidazolium ring. In only one family of cysteine peptidases, is the role of the general base assigned to a residue other than a histidine: in peptidases from family C89 (acid ceramidase) an arginine is the general base. Cysteine peptidases can be grouped into fourteen different clans, with members of each clan possessing a tertiary fold unique to the clan. Four clans of cysteine peptidases share structural similarities with serine and threonine peptidases and asparagine lyases. From sequence similarities, cysteine peptidases can be clustered into over 80 different families [PUBMED:11517925]. Clans CF, CM, CN, CO, CP and PD contain only one family. Clan CA includes proteins with a papain-like fold. There is a catalytic triad which occurs in the order: Cys/His/Asn (or Asp). A fourth residue, usually Gln, is important for stabilising the acyl intermediate that forms during catalysis, and this precedes the active site Cys. The fold consists of two subdomains with the active site between them. One subdomain consists of a bundle of helices, with the catalytic Cys at the end of one of them, and the other subdomain is a beta-barrel with the active site His and Asn (or Asp). There are over thirty families in the clan, and tertiary structures have been solved for members of most of these. Peptidases in clan CA are usually sensitive to the small molecule inhibitor E64, which is ineffective against peptidases from other clans of cysteine peptidases [PUBMED:7044372]. Clan CD includes proteins with a caspase-like fold. Proteins in the clan have an alpha/beta/alpha sandwich structure. There is a catalytic dyad which occurs in the order His/Cys. The active site His occurs in a His-Gly motif and the active site Cys occurs in an Ala-Cys motif; both motifs are preceded by a block of hydrophobic residues [PUBMED:9891971]. Specificity is predominantly directed towards residues that occupy the S1 binding pocket, so that caspases cleave aspartyl bonds, legumains cleave asparaginyl bonds, and gingipains cleave lysyl or arginyl bonds. Clan CL includes proteins with a sortase B-like fold. Peptidases in the clan hydrolyse and transfer bacterial cell wall peptides. The fold shows a closed beta barrel decorated with helices with the active site at one end of the barrel [PUBMED:14725770]. The active site consists of a His/Cys catalytic dyad. This clan includes peptidases with the papain-like fold. For those sequences which have a structure in the Protein DataBank, we use the mapping between UniProt, PDB and Pfam coordinate systems from the PDBe group, to allow us to map Pfam domains onto UniProt sequences and three-dimensional protein structures. The table below shows the structures on which the Peptidase_C1 domain has been found. There are 603 instances of this domain found in the PDB. Note that there may be multiple copies of the domain in a single PDB structure, since many structures contain multiple copies of the same protein sequence.